…I’m reminded of how smart I am. 12:48: I’m going to bed. It’s been a long night. But a good night! 12:47: Little chopper, going to be tough, Longoria can’t get it, Phils win!!! PHILS WIN!!! 12:47: Good eye, Ruiz takes outside. Count is 2-2. 12:45: Wow, that 96 MPH heater just blew by Ruiz. 12:44: Here we go, mi amigo Carlos. Bases loaded, no outs, bottom of the ninth. A run wins it. 12:42: So they’re going to walk Dobbs and have bases loaded with five infielders. If this works, Maddon is a genius. If it doesn’t, he’s a wackjob. Life is risk. 12:40: They intentionally walk Victorino. Maybe Maddon’ll do something weird here. Ah, maybe another intentional walk and a five-man infield. Sounds fun. 12:38: Holy Crap! Victorino tries to bunt, the pitch is wild, Bruntlett goes to second, bad throw to second gets away, Bruntlett gets to third with nobody out. He’s the winning run! LET’S GO!!! 12:37: I was kind of hoping that Maddon would make some really odd managerial move. 12:35: This Sprint “You want everything” romantic-movie-spoof is just horrible. It’s everything that’s wrong with television advertising. A bad, corny, cheesy premise and a big budget. 12:34: Bruntlett takes one for the team. Good job, son. 12:33: You know it’s a.m., so I’m not typing it any more. 12:32 a.m.: By the Beard of Bruntlett! C’mon, Eric! 12:31 a.m.: J.P. Howell still in there for Tampa? Not sure I like this move either. 12:29 a.m.: We need a hero. We could also use Bonnie Tyler singing “I Need A Hero.” Bottom of the 9th coming up. 12:28 a.m.: Buck messing with McCarver about his previous mistake (country of origin for Carlos Ruiz). 12:27 a.m.: Fans active now, waving those white towels (reminding me of surrender). 12:26 a.m.: Two down as Gross grounds out weakly to second. 12:24 a.m.: OK, one out. Good job so far by Romero. 12:23 a.m.: I don’t like the way I feel about this game right now. And why are the fans not screaming? Is it too cold? 12:19 a.m.: Ryan Howard GOES DOWN LOOKING! Don’t these guys remember the FUNDAMENTALS??? Two strikes on you, and you SWING AT ANYTHING CLOSE! I can’t believe I’ve been reduced to using all caps. I’m tired and frustrated. 12:17 a.m.: Ryan Howard down in the count 0-2. Doesn’t look good. 12:16 a.m.: Some kind of crazy move, and Werth is picked off. Craptastic. 12:15 a.m.: Utley whiffs. Darnit! That pitch dropped off the table. 12:13 a.m.: Werth can fly for a tall dude. Steals second base, gets in scoring position with 0 outs. 12:09 a.m.: Utley Time. C’mon, Chase. Need a knock here. 12:08 a.m.: I have never stayed at a Holiday Inn Express. Guess I’m a dummy. 12:05 a.m.: Werth walks! Werth walks! Werth walks! 12:05 a.m.: I like Jayson Werth. He has the potential to go 25HR/25SB next year. 12:02 a.m.: Another re-make. The Day The Earth Stood Still. Keanu plays another alien or quietly weird character. More importantly, are there no new ideas in Hollywood? 12:01 a.m.: Ah, good work, J.C. Romero. Crawford Danger averted. 11:59 p.m.: Coming up on 1:00 a.m. for my Eastern time zone family/friends. Wonder how many are hanging in there. 11:56 p.m.: WHY OH WHY did Ruiz bother throwing? Upton was going to beat that. Oy freakin’ vay. Error, tie game. 11:56 p.m.: Not sure if “Eva” is a super-insulting chant, Phils fans. 11:55 p.m.: Upton steals, Longoria needs a single to tie. Ugh. 11:55 p.m.: You went, Pena! Strikeout! 11:51 p.m.: And Upton’s younger brother Justin is supposed to be as talented or more talented. Yikes. 11:50 p.m.: Wow, Upton can fly. C’mon, Mad Dog, roll two (that’s “induce a double play” for you non-infielders). 11:48 p.m.: Madson has a tough job here. Let’s go, Mad Dog! 11:46 p.m.: “There’s one thing…we’re nudists.” And the guy lets them in the car. Did he put down a blanket or something? And why the heck doesn’t he just say “Oh, never mind” and leave the dumbass naked balloonists to find their own way home? 11:45 p.m.: Jimmy Rollins. Why don’t you bunt, Jimmy? Lay one down, get on base again. 11:44 p.m.: Geoff can’t get ‘er done. Oh well. 11:41 p.m.: Geoff Jenkins! I like this move. 11:40 p.m.: Will you be leaving work for a break to get your free Taco Bell taco? 11:39 p.m.: I guess I should be grateful they haven’t shown the Rocky statue or Art Museum steps. However, I’ll retract that statement if I could see McCarver tripping and falling all the way down the steps. 11:38 p.m.: One more shot of the Liberty Bell, and I will vomit. Y’know, there are other things in Philly besides the Liberty Bell and the corner where Geno’s and Pat’s Steaks are. 11:36 p.m.: Not that there’s anything wrong with all these armed forces folks singing “God Bless America,” but didn’t this job used to belong to professionals? 11:35 p.m.: YES! K’d him! Great job, Scott. 11:34 p.m.: OK, Scott, put him away here. More outs, faster game, less McCarver. 11:33 p.m.: I appreciate Scott’s “underbeard,” as I like to call it. 11:32 p.m.: C’mon, Scott. Good pitch to start. Excellent. 11:30 p.m.: The difference is Drinkability? No, there really isn’t much of a difference, and some made-up word isn’t helping. 11:29 p.m.: Oy, a walk. I hate walks. Go get ‘im, Cholly. 11:26 p.m.:This Christie Brinkley DirecTV spot has run approximately 475 times tonight. Luckily, I will always love the “This is crazy, this is crazy, this is crazy” line. 11:24 p.m.: Take a bow, Jamie…great job. Bullpen time. 11:24 p.m.: Fantastic play by Howard there. 11:23 p.m.: If Gabe Gross hits a 3-run bomb off Moyer, I’m driving to DFW, flying to Philly, and taking over as Phillies manager for the rest of the Series. 11:22 p.m.: And now the Rays are proving me right, as they’re knocking Moyer around a bit. 11:21 p.m.: Getting back to Moyer being allowed to pitch the 7th…I think that’s one of those Charlie Manuel moves. He sticks with his guy, and I get it. But the Phils’ bullpen is awesome. 11:19 p.m.: It’s so weird, how hittable Moyer’s pitches look. I mean, I’ve hit in a batting cage with 80 MPH pitches coming at me. And I got as high as D-III ball. 11:17 p.m.: CRAWFORD WAS OUT AT FIRST! ANOTHER UMPIRING MISTAKE! BRING ON THE ROBOT UMPIRES!!! 11:16 p.m.: Whoa – Moyer comes back out for the 7th? Not sure I’d do that. 11:12 p.m.: Me gusto Carlos Ruiz. 11:10 p.m.: They just showed submarine-style pitcher Chad Bradford warming up for Tampa Bay. I get that that particular motion is much easier on the arm – then why don’t starting pitchers ever use it? It’s always relievers – Kent Tekulve, Dan Quisenberry, etc. 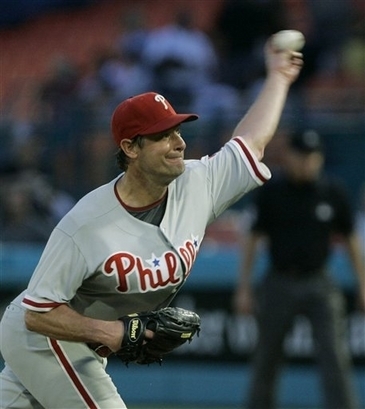 11:09 p.m.: A shout-out to Jamie Moyer for some awesome pitching tonight. He did his job beautifully, holding the Rays to just one run in six innings. Not bad for an almost-46-year-old. 11:07 p.m.: On the replay, Utley’s bomb looked like it went to the seats that my friend Marty and I used to have. 11:06 p.m.: Oy, Ryan Howard. Will you ever hit again? 11:05 p.m.: Chase Utley…BOMB! 3-1. –The Phillies REALLY need to get a hit with men in scoring position. This is ridiculous. –The umpires have shown (and that Fox Trax or Trak or whatever has shown) that they are frequently wrong and totally replaceable. Weirdly enough, I think the Rays could have won Game 1 if the calls had been correct, while the Phillies had a shot at Game 2. –I still hate Tim McCarver as an announcer. He may be a good guy or a decent family man or a soup kitchen volunteer, but he brings me no information or entertainment as a broadcaster. –Didn’t Jimmy Rollins learn to bunt a couple years ago or so? How about being a sparkplug and getting on base? –Pat Burrell’s next/last big contract is getting smaller with every at-bat. –Maybe a sports psychologist needs to talk to the hitters. –Brett Myers wasn’t good, but he wasn’t horrible. –I really hope the home-field advantage works for us. If you’re reading this and going to one of the games, scream your head off. It’s your duty. –I’d love to see Charlie Manuel do something crazy like Rays manager Joe Maddon does. Like bat Ryan Howard leadoff to get him more at-bats. –I have a hard time believing that NL players who have “played” DH in the past few World Series have batted less than .100. What is up with that? –I really like Joe Maddon’s postgame press conferences. He always has something interesting to say. I couldn’t believe he admitted he really didn’t know what the Phillies team was all about. Did he not watch any SportsCenter or Baseball Tonight ever? No game films after winning the ALCS? No scouting reports? And yet, he’s perfectly calm and cool about it. –I think that if the Phils are to win this Series, they have to sweep all three at home. And I’m not sure they can do that. –Jamie Moyer needs to step it up in what could be the biggest game of his career. –People are still sleepin’ on Joe Blanton. I have faith in Big Joe. He is most decidedly NOT a belly-itcher. On August 19, 2006 (thank you very much, Baseball-Reference.com), the Philadelphia Phillies sent two young minor-league players to the Seattle Mariners in exchange for veteran left-hander Jamie Moyer. Since that day, Mr. Moyer has compiled a stellar record of 34 wins and 21 losses for the Phillies; the two young men have yet to appear in the major leagues. Whither art thou, Andrew Barb and Andy Baldwin? I say all that to say this: Jamie Moyer is The Freaking Man. He turns 46 on November 18. I repeat, 46. And he competes with the best baseball players on the planet. And he schools them. He’s the oldest player in the game, and while he may or may not be a Hall of Famer, he’s an accomplished pitcher who’s been doing it for a really really long time (and doing it well). Twenty-two years in the majors. Chicago, Texas, St. Louis, Baltimore, Boston, Seattle and now Philly. Because I think he’s a crucial component to the Phillies’ success – both recent past and present – and I admire the heck out of this man. He’s never been to the World Series, but I hope he gets there with the Phillies this year. If not, hey, there’s always next year – even for a 47-year-old lefty.